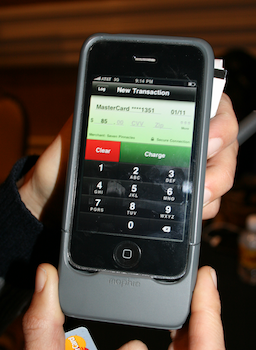 [CES 2010] Mophie Unveils New iPhone Credit Card Reader | OhGizmo! Today Mophie unveiled their latest case for the iPhone, which does more than just protect your device. Their new Mophie Marketplace is actually a credit card readers for iPad, but specifically for the iPhone. The case extends a little bit past the bottom of the phone, to accommodate the reader. When combined with Mophie’s specially-designed app, anyone with a merchant number can process cards right from their iPhone. The case looks very much like the Juice Pack Air that I reviewed last year, and similarly interfaces through the 30-pin connector. It also has the same micro-USB connection which will allow you to sync and charge your phone without removing the case. The application is very straightforward. You just open it, slide the credit card and fill in the amount you want to charge. 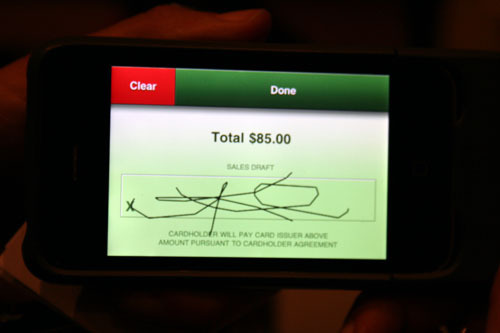 Turn the phone on its side (to landscape mode) and it will automatically display a line on which your customer can sign with their finger. Hit the button to process, and it will show a notification which tells you whether or not the transaction was approved. You can also use one of several other credit card processing apps on the market, so you aren’t tied down to the one from Mophie. The case will be out later this year with a price that has yet to be determined. That's pretty cool. We have a merchants that come to our work and this would be perfect for them. They have these satellite ones that sometimes don't work well and that scares me when they process my card.